"The planned investment in the new polyamide 12 powder facility represents the next step in our growth strategy. Our intention is to solidify Evonik's leading position as a provider of polyamide 12-based high performance polymers and utilize the growth potential of new application areas," said Dr. Ralph Sven Kaufmann, COO of Evonik. Evonik is the market leader for polyamide 12 powders, which are sold under the brand name Vestosint. The powders are used, for example, to coat metals for household appliances such as dishwasher baskets, but also in automotive and medical technology production and as matting and structural agents in coatings. Evonik also anticipates significant increases in demand in tool-free production-especially in the 3D printing industry. "We project attractive market growth. The new production line in Marl will meet the growing demand for PA12 powder products in the long term to support our customers' growth," said Dr. Claus Rettig, the Chairman of the Board of Management of Evonik Resource Efficiency. 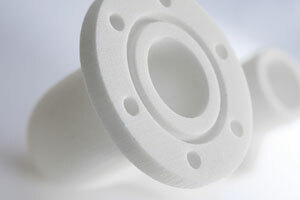 Due to their mechanical properties and chemical resistance as well as the high melting point of finished products, PA12 powders are particularly suitable for use in powder-based 3D printing processes such as selective laser sintering (SLS) and high-speed sintering (HSS). Fiber composite materials represent another growth field. Polyamide 12 powders are an ideal matrix for thermoplastic composites made of fiberglass, carbon fibres, and aramid or steel fibres. Applications can be found in the automotive and oil drilling industry, the sports sector and in orthopedics.